Many fisheries stocks and the livelihoods of those who make their living from fishing are in decline, and these declines are exacerbated by uncertainties associated with increased climate variability and change. Social scientists have long documented the importance of mobility and diversification in reducing the risk and uncertainty associated with climate variability, particularly in the context of small-scale fishing. However, it is unclear how these traditional mechanisms are buffering fishers against the varied stressors they currently face, including those associated with environmental variability. This paper examines how fishers on the southern gulf coast of the Mexican state of Baja California Sur perceive and respond to stressors associated with normal environmental variability, how their ability to adapt is spatially distributed, and what threats they perceive to their continued ability to adapt. Understanding the adaptation strategies and everyday vulnerabilities that fishers face can elucidate problems associated with current fisheries management and the underlying factors that cause vulnerability, and also help decision makers, including fishers themselves, develop more effective adaptation strategies in the face of climate change. Small-scale fisheries are a major source of livelihood for people living in the Mexican state of Baja California Sur. Nevertheless, as in many parts of the world, small-scale fishers in Mexico face many challenges like competition with coastal tourism and other fishing sectors, declines in fish stocks, climate variability, and market fluctuations. Sustaining small-scale fisheries has only recently been prioritized in fisheries management and development policy (Cudney-Bueno et al. , Villanueva-Aznar et al. ). A key question is how well fishing communities are able to adapt to environmental and institutional variability, both now and in the future. The focus on adaptation has a long history in anthropology (e.g., McCay ). Now, it is commonly used to examine how people adjust to and cope with environmental change and uncertainty, with linkages to ideas of risk, vulnerability, exposure and sensitivity (Head ). The Intergovernmental Panel on Climate Change (IPCC) defines adaptation as “adjustments in natural or human systems in response to actual or expected climatic stimuli or their effects, which moderates harm or exploits beneficial opportunities” (Intergovernmental Panel on Climate Change IPCC a). As people are often not reacting specifically to climate change, a more general definition is a change in a system allowing it to better cope with or adjust to a particular change or stressor. Fishers continuously confront multiple environmental and social stressors that necessitate changes in their behavior. In this paper, I focus on how individuals and households on the southern gulf coast of Baja California Sur adapt to stressors associated with seasonal changes that affect fisheries, and how these stressors interact with other drivers of change, including shifts in marine management and associated regulations. Early work on fisheries and climate change focused on documenting trends in fish abundance and distribution (Glantz , Cushing ). Syntheses of responses of fishing communities to change highlight several common short-term strategies: intensification and diversification of fishing, migration or mobility, and practices like seeking employment in other sectors, relying on social networks, and waiting for fisheries to improve (e.g., Perry et al. ). In this paper, I focus on two strategies fishers use to buffer uncertainty: mobility and diversification (e.g., Löfgren , Andersen , Allison and Ellis ). Mobility refers to movement by fishers to new fishing grounds, which often follows seasonal fish movements, enabling more continuous income generation. Diversification is the process by which a household increases its number of income-generating activities, both inside and outside of fisheries (Ellis ). Often studied in association with adaptation, diversification is a household risk management strategy used to spread risk, smooth the effects of temporal variations in access to resources, and reduce vulnerability (Allison and Ellis , Hoorweg et al. ). For example, in the Pacífico Norte area of Baja California Sur, during and after El Niño events, some cooperatives diversified from lobster and abalone to include other taxa such as finfish, whelk, sea cucumber, and sea urchin (McCay et al. ). On the southern gulf coast of Baja California Sur, most research on fisheries and environmental variability has focused on documenting fluctuations in fish abundance and distribution (e.g., Aburto-Oropeza et al. , ). In other parts of the Gulf and Pacific coast, scholars have investigated adaptation strategies and vulnerability of fishing communities to climate change (e.g., McGuire and Greenberg , Vásquez-León , , McCay et al. , , Morzaria-Luna et al. ). Vulnerability is often described in the climate change literature as a function of the exposure and sensitivity to a stressor and adaptive capacity, or the ability to respond (e.g., Smit and Wandel ). Most individuals and communities can cope with small deviations from average environmental conditions, but they may not be able to adapt to conditions outside of a certain threshold. Peoples’ ability to modify or change behavior to cope better with an external stressor will vary among individuals and households within a community (Adger et al. ) and even between neighboring communities (Cinner et al. ). Vulnerability has both social and ecological dimensions (e.g., Perry et al. , Cinner et al. ); changes in ecological systems affect fishing communities and vice versa. Some cases examining community responses to environmental change focus on major shocks like coral bleaching (e, g., Cinner et al. ) or large ENSO (El Niño-Southern Oscillation) events (e. g., Broad ). In other cases such as this one, impacts are more subtle and fishers may not even perceive the effects of environmental change when compounded by other stressors like declines in fish stocks, new fishing regulations, and market fluctuations. In this paper, I rely on qualitative methods and directed analysis at the local scale to understand how fishers describe their own adaptation strategies and vulnerabilities to normal seasonal variation. Understanding how local fishers are already adapting to changes along with their current concerns can shed light on the broader social, economic, and political context in which they live and work. By identifying problems they associate with current fisheries management, we can work towards reducing fisheries’ vulnerability to both climate variability and change. In the Global South, the state generally does not play a direct role in developing climate change adaptation strategies, and communities have developed bottom-up, local-scale practices. In Mexican fisheries in particular, while state economic and policy changes influence local-level decisions, these are often indirect effects (e. g., Young , Cinti et al. , Basurto et al. ). While it is unclear in many cases how climate change will affect fisheries, it is possible to understand stressors associated with normal environmental variability that local people face and how they modify their behavior to adapt to these stressors. Climatic conditions are inherently variable, on annual and decadal time periods. Thus, adaptation to climate change will necessarily include the ability to cope with variability (Katz and Brown , Smithers and Smit , Smit et al. ). Focusing on how local people change their behavior to cope with normal environmental variability rather than rarer large-scale events also can help elucidate current problems with fisheries management and the underlying factors that cause vulnerability (Coulthard ). Southern Baja California Sur provides a good setting in which to study adaptation strategies. It is flanked by the Gulf of California (hereafter, “the Gulf”) to the east, which is one of the most significant fisheries regions in Mexico, and the Pacific Ocean to the west. The gulf region produces approximately 71% of fisheries landings by volume and 57% by value in a given year (Organisation for Economic Co-operation and Development OECD ). Small-scale fishing (or pesca ribereña) is one of the region’s most important activities: nearly 18,000 small boats operate in the region (Cisneros-Mata ). In some areas, 90% of the landings correspond to small-scale fisheries (Erisman et al. ). Most fishing cooperatives on the gulf coast are not involved in fisheries co-management. A few cooperatives in the La Paz area are able to influence the fishing practices of their members, especially related to size selection and the use of specific fishing gear in particular habitats (Reddy et al. ). However, as they lack rights to particular species or areas, none actively patrol fishing areas. Environmental variability, particularly ENSO events, impact key fisheries species in the Gulf (Aburto-Oropeza et al. , ), as well as fishers’ decisionmaking (Micheli et al. . A recent UNFCCC report (UNFCCC ) noted that Mexico is at risk for extreme weather events and sea level rise associated with climate change. And it is not only climate change that coastal communities are facing. Like many coastal areas around the world, since the 1970s the economy has steadily been transitioning away from agriculture and fishing and towards tourism and service (Lauterio and Arizpe , Gamez and Angeles ). In the 1990s, the region also was recognized as a biodiversity hotspot, and conservation tools such as marine protected areas began to be implemented (Cudney-Bueno et al. , Álvarez-Romero et al. ). It is unclear how these changes will affect fisheries in this area or how individuals and groups will respond. This paper examines the strategies that fishing communities in southern Baja California Sur use to adapt to environmental variability. I answer four questions: 1. How do fishers perceive seasonal variability? 2. How do fishers adapt to this variability? 3. How is the ability to adapt distributed spatially? 3. What threats do fishers perceive to their continued ability to adapt? Data informing this paper come from 60 household surveys (of the approximately 500 households that depend on fishing in the focal communities) and 30 interviews with community leaders and government officials that investigate the vulnerability and adaptive capacity of fishers in the face of environmental variability and institutional, political, and economic changes in the Mexican state of Baja California Sur (Figure 1). This study was undertaken as part of a 2-year postdoctoral project in association with a broader Coupled Human and Natural Systems NSF project (GEO 1114964). Combining anthropology, ecology, and economics, this project integrated social and ecological data to understand social and ecological responses to environmental and institutional changes in southern Baja California Sur, particularly those related to small-scale fisheries. It also draws from participant observation over the course of four visits over a total of five months between 2011 and 2012. Household survey sites (Map credit: Miguel Castrence). When I first began the study, I intended to speak with fishers about inter-annual variation to better understand their perceptions and responses to the changes in fish abundance and distribution that biologists had found to be associated with ENSO events. However, while fishers on the gulf coast of Baja California Sur said that they had not seen impacts of the large 1998 ENSO event and did not note any clear inter-annual patterns in fish abundance or distribution, they spoke about intra-annual climate variation. We adapted our research plan accordingly. Themes covered in the surveys include basic demographics, information about fishing activities and patterns, perceived changes in fisheries, organizational strategies, adaptive capacity, and perceptions and use of marine protected areas. This study focuses primarily on adaptation practices and vulnerabilities. Specifically, how do fishers cope when fishing locally is not a viable option? What other kinds of income-generating activities do household members engage in? What is the seasonality of these activities? Can non-fishing work be alternated with fishing or is it full-time? Does non-fishing work require moving to another location? I pre-tested household surveys with 15 fishers in La Paz and El Sargento. Households with active fishers over 18 years of age were randomly selected in the city of La Paz (pop. 215,000), four rural towns of 900–5,000 people (El Sargento, El Centenario, San Juan de la Costa, La Ribera), and five very rural communities of 50–400 people (La Ventana, Boca del Sauzoso, Punta de los Muertos, Alfredo V. Bonfil, Agua Amarga) (Table 1). These locations were chosen to encompass a range of community types, from urban to very rural. As a list of active fishermen was not available for any of the locations, I worked with community leaders to identify fishing households. I then selected every third household. In the case of La Paz, I randomly selected areas in the town, and selected every third household where fishing gear (boats, nets, etc.) was visible in the yard and a fisher was at home and available to be interviewed. ** Estimated based on interviews with community fisheries experts and 2010 CONAPESCA data. A range is given, because of the presence of unregistered fishers. I conducted surveys with a local research assistant for two months in 2011-2012. In most cases, I interviewed the fisher alone, but sometimes other fishers or his family were present I also conducted semi-structured interviews with fishers, fishing cooperative presidents, nongovernmental organization workers, and government fisheries managers associated with the federal agencies like CONAPESCA and SEMARNAT during all four visits in 2011–2012. All interviews and surveys were conducted in Spanish. I then entered the surveys into an SPSS database for analysis. I audio recorded the interviews, transcribed them, and coded them using the qualitative data analysis software NVIVO 10. The general approach to transcript analysis was grounded theory (Glaser ), whereby interview transcript data were coded and categorized into themes that arose from the text, rather than based on a preconceived coding scheme. The themes that arose in the transcripts and explored in this paper include those related to inter-annual climate variations, fisher mobility, livelihood diversification, and fishers’ perceived threats to their continued ability to adapt to variation associated with both environmental and regulatory change. The study region encompasses ten fishing communities located in the southern portion of the Baja California Peninsula, in and around the city of La Paz, in the state of Baja California Sur, Mexico. La Paz is by far the largest city in the otherwise sparsely populated state. Baja California Sur is made up of five municipalities: Mulege, Loreto, Comondu, Los Cabos, and La Paz. The latter two municipalities make up the southern end of the peninsula and represent the major population center in the region. They are also sites of mass tourism development and have experienced a great deal of coastal land use change in the past 30 years (Gamez and Angeles ). In the 1950s tourism in Baja California Sur mainly consisted of people from the United States visiting Los Cabos to charter fish and Mexicans from the mainland visiting La Paz for duty free shopping (Gamez and Angeles ). It has grown substantially and diversified since this time. Approximately 40% of the regional economy is now dependent on tourism, which employs about 30% of the state’s inhabitants (Gamez and Angeles ). Tourism investors in the area are mostly foreign. While La Paz has a more diversified economic base than Los Cabos, tourism has risen in importance over the past ten years. There are many impacts of tourism across the region. Resorts, second homes owned by Americans and Canadians, and golf courses are growing in number on the gulf coast (Gamez and Angeles ). As tourism growth is closely linked to the US market, it fluctuates depending on the US economy and perceptions of safety in Mexico. The number of international arrivals to Baja have decreased since 2008, but are beginning to rise again (Global Hospitality Resources, Inc ). Fishers in the Baja California peninsula are of relatively recent origin. Early populations were efficiently utilizing the region’s inshore marine resources at least 10,000 years ago (Carmean ). However, by the 1800s, native groups had either been decimated by disease brought by Europeans, or had migrated or intermarried (Aschmann ). Beginning in the 1500s, La Paz and the surrounding area hosted a world-renowned pearl fishery that lasted until the early 1900s (Gerhard ). This fishery was linked to Spanish colonization efforts; the Spanish initially came to the region in search of pearls. After the pearl fishery declined, commercial marine harvest focused on sea turtles and shark to sell to merchant ships from the US and for trade with inland communities (Chenaut ). Largely due to state subsidies and policies encouraging migration from the Mexican mainland, numbers of fishers in the Gulf rose from about 10,000 in 1945 (Higgins Industries Inc ) to around 120,000 in 2009 (unpublished INAPESCA data). Today Baja California Sur’s more than 2000 km of coastline supports a diverse fishery (Robadue , Enriquez-Andrade et al. ). In the area surrounding La Paz, small-scale fishers targeted 55 taxa in 2010. These taxa include particular species like Pacific red snapper or huachinango (Lutjanus peru) and broader taxonomic groups like sharks (Elasmobrachii). Of these 55 taxa, 20 comprised approximately 90% of the biomass and the value created by small-scale fishers (based on 2010 CONAPESCA data). However, the top 20 taxa vary markedly in their landed price per kg (Leslie, HM, et al. Operationalizing the social-ecological systems framework to assess sustainability. Submitted). Fishermen are paid more than 150 pesos (12 USD) per kg for lobsters, for example, whereas most other taxa bring less than 13 pesos (1 USD) per kg (Leslie et al., unpublished data). Taxa landed by La Paz fishers include both coastal and offshore species, and inhabit a wide range of marine habitats. Some, like the chocolate clam (Megapitaria squalida), inhabit shallow sandy estuaries, whereas others, like the snappers (Lutjanidae), groupers (Serranidae), spiny lobsters (Panulirus inflatus), and triggerfish (Balistes polylepis), are more closely associated with rocky reefs (Leslie, HM, et al. 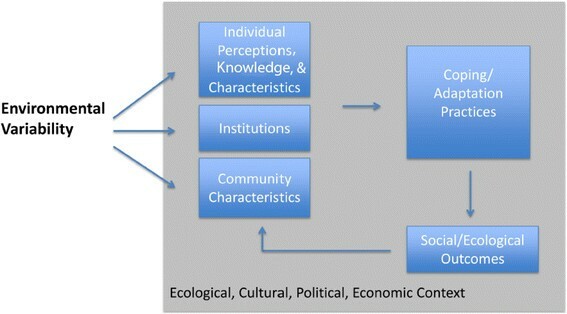 Operationalizing the social-ecological systems framework to assess sustainability. Submitted). Still others are pelagic species, including yellowtail (Seriola lalandi), ocean whitefish (Caulolatilus princeps) and Spanish mackerel (Scomberomorus concolor). These species have different life histories and habitat preferences, which require that fishers be knowledgeable and adept in multiple fishing techniques. Many fishers use more than one gear type depending on their target. However, their ability to use different gear types is often constrained by the permit. While many fishers in this area are very proud of using hook and line, there are several other common gear types: gillnets or lured lines to catch pelagic fish like pacific sierra (Scomberomorus spp), longlines for sharks and other pelagic species, and diving with hookah (connected to a surface air supply in shallow waters for sedentary species like sea cucumbers and clams) (Arreguín-Sánchez et al. ). Many fishers in this region also participate in the charter boat or sportsfishing sector mainly targeting dorado (Coryphaena hippurus), marlin (Tetrapturus audax), and sailfish (Istiophorus platypterus). The majority of fishers in Baja California Sur are small-scale, involving small catches and boats (7–9 meter outboard motor boats, or pangas) (Figure 2). Small-scale fisheries make up about 40% of the total national catch (Arreguín-Sánchez et al. ). Nevertheless, small-scale fisheries have received little attention from the federal government when compared to the industrial fisheries targeting shrimp and small pelagics like anchoveta and sardines (Cinti et al. ). Small-scale fishers using hook and line (left) and gillnet (right) in La Paz. Since the early 2000s, two federal agencies have been charged with regulating fisheries in Mexico: SAGARPA (via CONAPESCA, the National Fisheries Commission) and SEMARNAT (which regulates the use of species listed under special protection). Fishing permits have been the most common management tool used to regulate access to marine resources. Permits designate specific species (e. g., octopus, clams) or groups of species (e. g., escama, which includes 271 species of finfish, or shark, which includes 46 species of elasmobranchs) to be harvested within a delineated region. It is likely that these permits that allow for catching multiple species are allowing fishers to diversify. See (Leslie, HM, et al. Operationalizing the social-ecological systems framework to assess sustainability. Submitted) for more information on the social organization and governance of fisheries in this region. Despite management efforts such as marine protected areas, area-based concessions, and permitting, scientists have documented a downward trend in the abundances of many marine species in the Gulf (e. g., Sala et al. , Sáenz-Arroyo et al. , Cudney-Bueno et al. ). There is also a high degree of illegal activity that occurs, often an unintentional result of externally-imposed regulations (Vásquez-León , Cinti et al. ). It is within this context of little management of small-scale fisheries and increasing scientific and community concern that I conducted this investigation in order to understand how fishers perceive and adapt to environmental change. People living on the southern tip of the Baja California peninsula have traditionally adapted to seasonal changes in resource availability. There is archaeological evidence dating back at least 10,000 years that points to coastal communities diversifying resource exploitation through seasonal movement (Carmean , Des Lauriers ). Environmental variability occurs on both intra-annual and inter-annual cycles. Over the course of the year, the region experiences two main seasons. During summer months (June through September) weak winds blow from the southeast, while in the winter (November through February) strong northwest winds (locally known as las collas nortes) blow for several days at a time. Water temperature also varies seasonally between winter and summer in the Gulf. In the La Paz area, sea temperatures in the summer average 28.4 degrees C and 22.5 degrees C in the winter (Lluch-Cota et al. ). While some species are available to fishers year round, others migrate seasonally. Catch data confirm seasonal variation. ENSO is the most significant inter-annual signal in the region (Herrera-Cervantes et al. , Lluch-Cota et al. ). ENSO events occur every two to seven years and are associated with large-scale changes in wind, rainfall, sea surface temperature, and surface pressure. Scientists have found that fish species respond very differently to these changes. With warmer water temperatures, slower upwelling, and increased rainfall associated with a strong El Niño event, some may have their growth delayed, others may fail to reproduce, and some may change their distribution patterns (Lluch-Cota ). For example, using landing statistics from the southern Gulf over 11 years, Aburto-Oropeza et al. (, ) show that fisheries landings of two economically significant species of reef fish, leopard grouper (Mycteroperca rosacea) and yellow snapper (Lutjanus argentiventris), are related to ENSO events, and particularly climatic conditions at the time of settlement. Leopard grouper larvae settle in shallow sargassum seaweed beds. However, because ENSO events affect the fishes’ recruitment, there is a lag time of four years for yellow snapper and seven years for leopard grouper between the event and when effects are observed in the fishery. How do fishers perceive seasonal variability? Fishers did recognize intra-annual variability. They distinguish between the cold winter months (tiempo de frío) and warm summer months (tiempo de calor). While some species are widely recognized to stay near La Paz all year (e. g., mullets (Mugil spp) and red snappers (Lutjanus peru)), other migratory species (especies de corrida) (e. g., marlin (Tetrapturus audax) and sharks (Elasmobranchii)) are present for several months and then move elsewhere. Fishers who target migratory fish (mainly charter boat operators and those who occasionally pursue squid (Dosidicus gigas) commercially) explained that marlin are present locally when water temperature is warm and squid are present in cold temperatures. And divers discussed that when it is unusually warm, the waters become nutrient poor and clams die. However, just because fishery species are present does not mean that they can be easily caught. Even resident fisheries species are known to have their seasons (temporada); fishers had explanations for why they are not caught during other times of the year. Some explained that there are months when a particular species bites and months when it does not (“hay meses cuando jalan y cuando no jalan”). A few suggested that this could be because the fish are not hungry all the time, and shared stories about pulling up nets and finding red snappers, which are normally caught with hook and line, and finding the fishes’ stomachs full of jellyfish. Fishers also tended to differentiate between the size classes of fish found during cold and warm seasons. For example, some said that in February only medium size red snappers are biting and that big red snappers either go deep or migrate when the water is cold. How do fishers adapt to seasonal variability? Fishers have a range of adaptation strategies when fishing locally is not a viable option. I focus on two of the main strategies fishers use to cope with seasonal changes in Baja California Sur: moving to a new fishing spot and livelihood diversification. He explained that during the winter the majority of pescado de primera (fish sold for the highest price) comes from the Pacific. On the Pacific coast there are a number of fishing camps that exist specifically for these seasonal trips; fishers go for days to even several months at a time. Fishers frequent spots around Bahia Magdelena and Los Cabos. 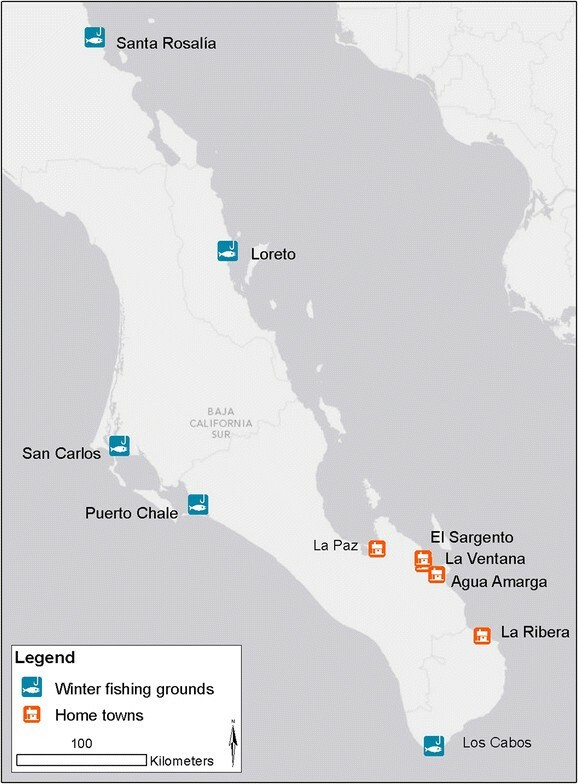 Several fishers also said that they go to Loreto and Santa Rosalia on the Gulf side during the winter (Figure 3). 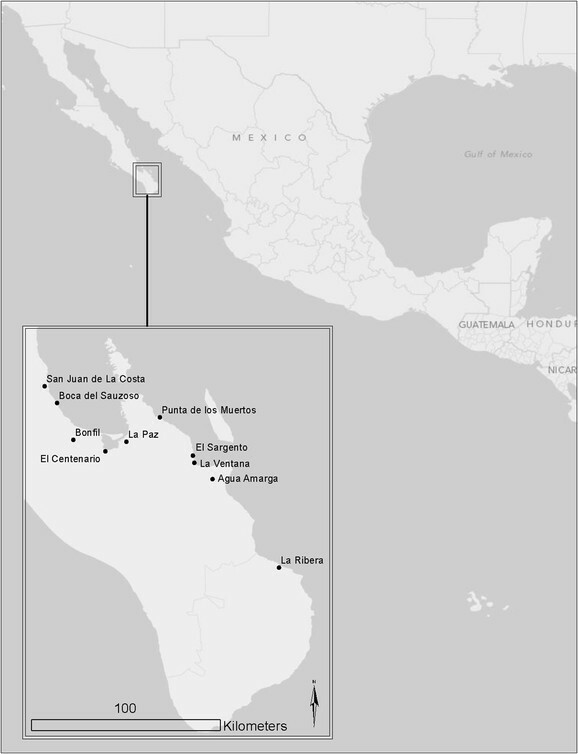 Typically from November to February, fishers in the La Paz area travel to either the Pacific coast (San Carlos, Puerto Chale or the Los Cabos area), or less frequently, to Loreto and Santa Rosalia on the gulf coast (Map credit: Miguel Castrence). One motivation to move fishing sites, besides the lack of fish nearby, is that fishers can make more money. Fishers tend to work longer hours when not at home and also occasionally target higher value species. For example, Don Felix in El Sargento is a 50 year old fisher who spends three months out of the year fishing pescado de primera in San Carlos. His father traveled to fish in San Carlos and as a young man he began to travel there as well. He earns between 10–40,000 pesos per month (~800-3,000 USD) in the Pacific compared to 6–8,000 (~460-614 USD) around El Sargento. Other strategies involve diversifying fisheries and occupations. Being a member of a cooperative that holds multiple permits allows fishers to fish for multiple taxa, and potentially in a more diverse set of locations. Multi-species permits for finfish and shark also allow them to fish for multiple taxa. Finfish is the most commonly held permit in the La Paz municipality, with over 50% of cooperatives holding it. Sixty-five percent (N = 39) of fishers surveyed had multiple occupations in their households. One fisher described these additional occupations as “trabajo del flojo” (work of the lazy, due to their not requiring a full-time commitment). Amongst younger fishers, several said that they added another job onto fishing when they needed a more stable income, often due to marriage or a new baby. Some older fishers stated that they switched occupations when they were no longer physically able to fish full-time. Others sought additional income when an opportunity arose. How is the ability to adapt to environmental variability distributed spatially? Not all fishers utilize the above adaptation strategies equally. Of the two major strategies, moving to a new fishing spot and livelihood diversification, there was a difference between fishers living in urbanized vs. very rural areas. In La Paz and the four towns with populations between 900–5000, 75% of fishers still traveled over 100 km to fish. In the towns with populations of 50–400, there were no fishers who traveled more than 100 km to fish. However, even amongst fishers who travel, some mentioned that they do not go to as many places as they did in the past. For example, in La Ventana, out of nine fishers surveyed, four did not go as many places as they used to go because they have lost access to the permits that enabled them to access other geographic areas, beyond their home municipality. Many of the people who no longer travel at all to fish cited old age, health problems, isolation, and families that required them to remain nearby. In the rural village of Bonfil, that requires a four-wheel drive to access, only one household still fishes. Don Guadalupe and his two sons fish while his wife runs a restaurant situated on the main highway. They no longer travel to other areas to fish because they do not have anyone with whom to share gas costs. Similarly, fishers in more populated areas tended to have more diverse livelihoods. In the city of La Paz, 80% of households included members who engaged in more than one occupation. In the four towns with populations between 900–5000, 58% of households had more than one occupation. And in the three towns with populations between 50–400, 29% of households had more than one occupation. In other words, fishers living in the city of La Paz are less dependent on fishing than those in rural areas. What threats do fishers perceive to their continued ability to adapt? Many fishers explained that a number of relatively recent events were challenging the ways they have traditionally adapted to environmental variability, making it harder to make a living from fishing. Specifically, fishers cited a combination of declines in fish catch and difficulties in access to fisheries. Ninety percent (N = 54) of fishers surveyed stated that their catch had declined since they began fishing. The main reasons given for this decline were both a reduction in the total number of fish available as well as loss of access to fish. Over half of the fishers surveyed stated that unsustainable fishing practices by other groups such as industrial shrimpers, nighttime spearfishers, gillnetters, those who use sophisticated equipment like sonar, and charter boat operators who practice catch and release were responsible for the decline. As discussed above in the section on seasonal variability, some fishers stated that overall fish abundance has not decreased but that the fish are not biting anymore (“la pesca no jala”). Another explanation for reductions in fish catch involved the loss of access to fish. Many lamented that it has recently become more difficult to diversify the species they target or to move to new fishing spots. This is due to both difficulties in accessing permits and more spatial and temporal restrictions on small-scale commercial fishing. Many older fishers remember a time when they could fish anywhere they desired. For example, in La Paz, I spoke with Don Enrique in his comfortable home office about changes in the fishery. Don Enrique was in his 60s and had been fishing since he was a child. 30 years ago he started a fishing cooperative so that his four sons could better access state subsidies, fishing equipment and permits. He described, “now our permits are only good for the municipality. If we go to Laguna de San Ignacio, they [other fishers] will chase us out…” Currently, even though permits can be issued for more than one municipality, in approximately 84% of cases observed in the 2010 CONAPESCA data for the state of Baja California Sur, fishers only had a permit for one municipality (Leslie, HM, et al. Operationalizing the social-ecological systems framework to assess sustainability. Submitted). Permits also specify a smaller fishing area than in the past. In addition to concerns about reduced access to fish is a perception that the state is privileging other sectors over small-scale commercial fishing. Don Enrique described “now there are a lot of marine parks and restrictions for sport fishing and diving; areas for commercial fishing are getting smaller…” He also said that the rules are not enforced for charter boat fishers in the same way that they, as small-scale commercial fishers, experience enforcement. One of his sons explained, “All the power is with tourism … the fisheries inspector lets charter fishing boats with tourists catch 20–30 marlin but if I catch more sandbass (Paralabrax spp) than I am permitted, I am fined.” Marlin (Tetrapturus audax), swordfish (Xiphias gladius), rooster fish (Nematistius pectoralis), dorado (Coryphaena hippurus), and sailfish (Istiophorus platypterus) are species exclusively dedicated to sport fishing within inshore waters (NOM 017-pesc, art 0.3). There is a common perception that local differences in power and resources allow for differential access to marine resources. Many fishers feel that the poor suffer the rules, or risk their lives breaking the law, while the wealthy can still access restricted resources. Additionally, there is a perception that non-fishing work is increasingly difficult to find. In most towns, fishers said that work is scarce. Fishers mostly compete for low- level jobs because their education levels tend to be low. Of the 60 fishers surveyed, only two had university degrees and the vast majority had only attended elementary school. The most common jobs for small-scale commercial fishers to have are as carpenters, painters, maintenance workers, and in the tourism sector (e.g., as sport fishing operators and tour guides). Some said that a decline in the number of tourists over the past several years has made tourism jobs more difficult to find. Also, at least two fishing cooperatives in the La Paz region have benefited from state and non-governmental programs that encourage engagement in ecotourism through capacity building and subsidizing the high entrance costs to this sector. However, those who work as tour guides state that in addition to there being fewer tourists, they find it hard to compete with resorts that offer packages that tourists can purchase online. There is a perception that the state would like fishers to move into tourism, however many feel that there are not enough jobs in tourism for everyone to be gainfully employed. They also associate this drop in tourists with a decreased demand (presumably by restaurants) for particular fish like grouper (see Reddy et al. for an example of how fisheries-related ecological and economic outcomes in this area are mediated by tourist demand). On the other hand, some mentioned that it is now easier for the younger generation to pursue other opportunities in addition to fishing. Many older fishers stated that education was a barrier for them in gaining alternative employment, but education opportunities have increased in recent years. The two fishers who had university degrees were both in their early 20s. While many fishers have children who are not involved in fishing, most younger fishers surveyed stated that they fish because they love it. Thus, there are still younger people entering fishing, but education opportunities are providing alternatives for some. Kenneth Broad () suggested that El Niño events provide opportunities for anthropologists to study societal responses and vulnerability to environmental change. Equipped with information on how several fish species responded to the large 1998 ENSO event that biologists on our research team had collected, I originally set out to examine how small-scale fishers on the southern gulf coast of Baja California Sur perceive and adapt to ENSO events. On my scoping trip to the region in 2011, I found that fishers did not associate the changes they noted in fisheries abundance and distribution with inter-annual variability. Furthermore, they said that they had not witnessed effects of the large 1998 ENSO event. Studies in other parts of the world (e.g., Glantz ) as well as Mexico’s Gulf of California and Pacific coast have shown that fishers often connect El Niño events to changes in the fishery. Fishers in the upper Gulf associate El Niño events with increases in freshwater from the Colorado River (McGuire and Greenberg ). Scientists and fishers in this area believe that fish catch has declined because of the discontinuation of river flow. (McCay et al. , ) have also documented how fishing cooperatives in the Pacífico Norte area of Baja California Sur have perceived and successfully adapted to El Niño events. They showed that when an El Niño event depressed the lobster and abalone stocks that fishing communities in the Pacífico Norte area of Baja California Sur relied on, fishers developed rules and practices aimed at sustaining these resources (McCay et al. , Micheli et al. ). In each of these cases, El Niño events were directly associated with a relatively rapid change in fish abundance and distribution. In the La Paz area, on the other hand, there are time lags between the event and when the effects are felt in the fishery. Additionally, signals may be obscured by the diversity of taxa targeted by small-scale fishers. Thus, I adapted this research to focus on the intra-annual changes that the fishers reported. As in many parts of the world, fishing-based livelihoods in Baja California Sur are adapted to deal with a certain degree of environmental variability. I focused on mobility and diversification as two components of fishers’ livelihood strategies: they enable fishers to spread risk, smooth variability in access to resources, and reduce vulnerability. However, fishers perceive that a variety of political, economic and ecological factors are reducing their ability to deal with normal seasonal changes. One of the factors that fishers identified as influencing their ability to respond to seasonal changes is a decline in species on which they have historically depended. While biologists have documented fisheries declines in the Gulf due to overexploitation (e.g., Sala et al. , Sáenz-Arroyo et al. ), for fishers, declines in catch are also related to loss of access to fishing grounds due to economic development and regulatory shifts (such as MPAs and the regionalization of permits). For many, the concern about the loss of access to fish is exacerbated by perceptions that rules are unequally enforced. In the literature there are markedly different perspectives regarding the vulnerability of coastal fishing communities (Bailey and Pomeroy , Pomeroy et al. ). Pomeroy et al. (, 7) portray coastal communities in a way that evokes Tawney’s () metaphor of a “man standing permanently up to the neck in water, so that even a ripple is sufficient to drown him.” Others have emphasized the inherent resilience of coastal fishing communities (Bailey and Pomeroy , Fauzi and Anna ). Bailey and Pomeroy argue that coastal communities’ dependence on not just a single fish stock but an entire ecosystem reduces fishers’ vulnerability to economic downturns and other instabilities. Fauzi and Anna () argue that fishers employ a variety of techniques such as temporal and seasonal migration and income diversification to cope with uncertainty. However, the ability to adapt to change is not evenly distributed amongst communities or even individuals within a community (Adger et al. , Cinner et al. ). Knowledge has been shown to be an important resource that allows small-scale fishers to adapt to variability in the Gulf of California and Pacific. Vásquez-León () found that small-scale shrimp fishers in the Gulf of California and the Pacific Coast of Mexico who are from traditional fishing families have access to knowledge that allows them to diversify when shrimp become scarce. Less knowledgeable fishers were more dependent on shrimp (Vásquez-León ). As few fishers in the La Paz region are dependent on a single species, and many are from multi-generational fishing families, knowledge likely plays less of a role in facilitating diversification, however, is still important in moving to new fishing areas, switching gear types, and procuring non-fishing jobs. Figure 4 provides an empirically grounded summary of how adaptation occurs among the small-scale fishers of the La Paz region of Baja California Sur. Fishers’ capacity to cope and adapt to environmental variability depends on their knowledge and perceptions, institutions, and individual and community-level characteristics. Furthermore, environmental variability affects associated human communities within a particular ecological, cultural, political, and economic context (McCay ). Fishers are not only responding to environmental variability but a host of other stressors. While other scholars recognize the importance of some of these factors over others (Adger et al. , Cinner et al. ), this framework emphasizes that institutions, knowledge and perceptions, and larger contextual variables are key determinants of how fishers are able to respond in this region. Fishers’ responses include strategies like moving fishing locations or diversifying fisheries or occupations, such as on the gulf coast, or developing rules to better manage fisheries. In turn, these responses influence social and ecological outcomes which provide feedbacks and influence the adaptation process. Conceptual framework illustrating how fishers adapt to environmental variability on the southern gulf coast of Baja California Sur. Please see text for details. Some individual and community-level characteristics that fishers in Baja California Sur identified match those in the literature such as access to credit, occupational mobility, occupational multiplicity, social capital, material style of life, gear diversity, community infrastructure, trust, capacity to change, and debt (Cinner et al. ). Fishers also identified factors like age and isolation. There are also broader considerations that influence how fishers are able to adapt. Fishers living in the city of La Paz are less dependent on fishing than those in rural areas and have more access to non-fishing work. In rural areas fishers identify a lack of available jobs and few other fishers with whom to share the gas costs required to move to new fishing areas as factors that affect their ability to cope with seasonal changes. We would expect that those currently less able to adapt to the stressors associated with the changes brought about by normal variation would face the greatest difficulties adapting to larger stressors that may be associated with climate change. Fishers also talked about the broader scale contextual variables that influence their capacity to deal with change such as changes in fisheries regulations, declines in fish stocks, and economic downturns that impact tourism and job growth in the area. Investigating the everyday vulnerabilities that fishing households experience can elucidate broader scale contextual variables that likely influence fishers’ ability to adapt to geographically extensive shocks, whether they are environmentally or institutionally mediated. The approach I took in Baja can also shed light on fishers’ perceptions of environmental variability and change, particularly whether they believe a problem exists and whether they feel capable of doing something about it (McCay ). On the gulf coast of Baja California Sur, fishers perceive that catch has declined but expressed little optimism that they can do something to improve their situation. Institutions, defined as both informal and formal rules for fisheries management, also influence fishers’ choices. Few fishers on the gulf coast feel that they have any influence over how fisheries are managed. Many describe feeling helpless in the face of unsustainable fishing practices and often upset that while they are paying the costs, coastal users that are operating illegally are reaping the benefits. Furthermore, there is a common feeling that traditional mechanisms of coping with change such as mobility and diversification are being undermined by new regulations that have led to reduced availability of permits and restrictions in fishing area. In order to reduce vulnerability of fishing households, we must confront these basic problems of fisheries management and the underlying factors that contribute to fishers’ vulnerability. Encouraging policies that enhance fishers’ mobility and ability to diversify is key. For example, offering grouped permits that allow for traditional strategies such as switching target species and fishing grounds could allow for greater flexibility. Whether this is already occurring amongst those who possess multi-species finfish and shark permits is a topic of ongoing investigation. Moreover, any new policy should recognize the multiple approaches and benefits of enhancing social and ecological resilience (Leslie and Kinzig , Basurto and Coleman ). Currently in the La Paz area most fishers do not actively participate in management decisions and there is little incentive to conserve resources in the face of illegal fishing and little ability to exclude others from using the same resource. Facilitating long-term adaptive responses by fishing communities will require creating institutions that provide incentives for sustainable use. It remains unclear how climate change will impact fisheries in Baja California Sur or how communities will respond. As environmental variability impacts fisheries and in turn, the well-being of associated human communities, understanding vulnerability to future climate impacts will require research on the vulnerability of fish species and their habitats as well as associated human communities. Historically, small-scale fishers have needed to deal with uncertainty so there is an expectation of change and a stock of knowledge and experience in coping with it. Until quite recently however, temporal and spatial variability in fish catch in southern Baja California Sur was described by fishers as somewhat normal and not problematic. Patchy seasonal variability has traditionally been a part of life for fishers in the region, and in response they have devised a variety of coping mechanisms. Despite evidence that marine resources were more abundant in the past, there is no archaeological evidence that communities have ever solely relied on these resources. Recently, however, a number of factors have caused fishers to become concerned about their continued ability to adapt to the suite of changes that are occurring. Predicting how small-scale fishers may respond to future environmental and institutional change can be informed by an understanding of their current adaptation strategies and vulnerabilities. Pressures from coastal development, declines in fish stocks, and changing societal expectations and allocation of marine resources are issues facing small-scale fishers in many parts of the world (Jentoft and Eide ). Understanding how these changes interact with fishers’ ability to respond to their already uncertain environment may provide insight useful for planning efforts. Adapting to climate change will require addressing some of the fundamental problems of fisheries management and ameliorating factors currently causing vulnerability. Policies that incorporate lessons about fishers’ adaptation strategies in response to past and current environmental stressors can mitigate future impacts by ensuring continued flexibility. This research was conducted while I was a postdoctoral scholar at Brown University and supported by the Coupled and Natural Systems (CNH) program of the US National Science Foundation (GEO 1114964). Thank you to community members in the La Paz area who agreed to be interviewed for this research. Thank you to Heather Leslie for comments on earlier drafts of this paper and related fisheries data analysis, based on CONAPESCA data synthesized by Octavio Aburto and colleagues from Scripps Institute of Oceanography and the Center for Marine Biodiversity and Conservation in La Paz. I also thank my mentors and collaborators on the broader NSF project: Heather Leslie, Sriniketh Nagavarapu, Sheila Walsh Reddy, Octavio Aburto-Oropeza, and Gustavo Hinajosa, Manuel Calderon Parra, Alexandra Sánchez, Juan José Cota, and Dalia Sarabia; and particularly Xavier Basurto and Mateja Nenadovic for their valuable comments on this paper and collaboration. Additional support was provided by the David and Lucile Packard Foundation (grant to Heather Leslie) and Brown University’s Environmental Change Initiative (grant to Leila Sievanen and Heather Leslie). The paper greatly benefited from feedback from three anonymous reviewers.